>>> if you go east further across the atlantic, winter has hit hard. stings are at a stand still in parts of great britain. in some places you can't move by road, rail or air and we wanted to show you how their evening news was covering the near total paralysis. >> vehicles abandoned and people forced to sleep in cars and trains through a long and freezing night. it's a whiteout. this stark, still scene signals the extent which britain is grinding to a stand still . >> i'm going to go back home. >> reporter: the snow closed the railway stations , too. trains were stranded where they stopped. when it left the plat tomorrow, this one was billed as the gastrick express. >> there's nothing going out and coming in except for more of this snow. >> i've been here for 27 hours. they provided cardboard blankets, which is not much of a help. 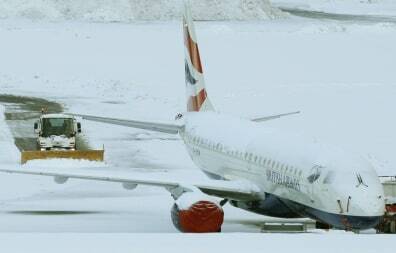 Flights at Edinburgh Airport were grounded Thursday due to the heavy snow.